I have been reflecting again on the subject of the spiritual battle. Three years ago this summer I wrote a post entitled Hope and the Spiritual Battle and to this day it remains one of the most popular posts I have shared. The post was written just before we headed off for our annual cross-cultural ministry adventure in Norway. We were feeling the heat of the intense spiritual battle going on around us as we were preparing to step out onto the front line. Throughout our time working with people (and especially while we have given ourselves full-time to our ministry) this has very much been the trend; the closer we get to the front line the more intense the spiritual battle. The past couple of months have been more challenging for the family, Debbie has been struggling a little again and there have been more behavioural issues from the kids than normal. Our weekly ministry nights and times when I have been speaking/leading or when I have had trips away have been particularly difficult. Whilst away in Norway helping on a Prayer team I shared a little of the situation and I was pointed to Ephesians 6:10-20. It was a very familiar passage but one which I have subsequently been doing some thinking on. 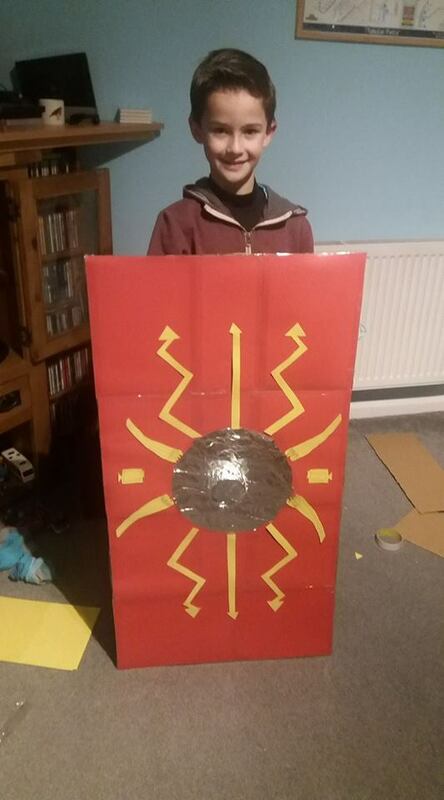 You will also see the photo alongside showing Ben proudly displaying his roman shield that he made for School. Ben was making this as I thought about the content of this post – a shield of faith perhaps? Lets look to Ephesians 6 for a brief journey into what Paul encouraged them to do to prepare for the spiritual battle. Paul’s shift in thinking here from what he had been saying about how we interact together as Christian community is considerable. He finishes this letter to the Christians in Ephesus with a stark reminder of the realities of the spiritual battle that lies ahead of us. Paul had previously mentioned the Devil earlier in the letter in 2:2 and 4:27; he stands opposed to everything God stands for and works hard to thwart the transformation that God is working in and through His people. The struggle says Paul is not so much again flesh and blood but against the spiritual forces of evil which are at work all around us. Paul here wants us to be aware of the enemy that we face and careful not to either underestimate him (or indeed to give him too much credit). To this end Paul urges us to do two things; (1) to be strong in the Lord and in His mighty power and (2) to put on the full armour of God so that we can take our stand. Notice the God focused nature of these commands; we are not just to be ‘strong’ but to be strong in the Lord and it is not so much about being dressed in armour but being dressed in the armour of God. We are in a battle and those we are up against are powerful, wicked and devious. Despite all that we are up against and our apparent weakness in the spiritual battle, Paul helps us see the Sovereignty of God and how He calls us to take up the armour He has given us. Having made his point Paul now spells out what this armour is. While writing his letter Paul was under chains (v20) and its likely that the soldiers who guarded him were the inspiration for him to describe the battle in this way. He details six pieces of armour (belt, breastplate, boots/feet, shield, helmet and sword) which he uses as pictures of the things that can help us to stand firm (truth, righteousness, gospel of peace, faith, salvation and the word of God). I don’t intend to go through them one by one (or this becomes a very long blog) but I would like to make a comment about the nature and usage of this armour. Note first that each item is crucial to our protection; we cannot do without any of them! All of the armour is primarily defensive in nature except for the Sword of the Spirit. Much of the armour also concerns what we believe about the world and about our standing before God; ideas like truth, faith, righteousness and salvation. These things are not to be taken for granted. Paul is clear that we must actively put on this armour if we are to take our stand against the devil’s schemes. Satan is described in the Bible as the tempter, the deceiver and the accuser. He loves to discourage and to instil fear in us. Sometimes he is quite overt in how he attacks us but at other times he is happy to be ignored, unseen and underestimated. The final verses in this section concern prayer. As we equip ourselves with this armour we are putting our trust in God. After all the armour is not an end in itself but an expression of our dependence on Him. Notice what Paul says about prayer here. We are to pray in the Spirit, led and guided by Him and making full use of the Spirit’s Sword, the Word of God just as Jesus did He was tempted in the wilderness (Luke 4). We are to pray on all occasions with all kinds of prayers with much perseverance on behalf of all of God’s people. We are in this battle together and we stand or fall together. Paul tells us to stay alert and to be watchful for the attacks of the enemy. I was reading 1 Peter 5 this morning which describes the devil as ‘prowling around like a roaring lion looking for someone to devour’. We are in a spiritual battle and will be until Jesus’ returns. Until then if we are to stand firm amidst the intensity of the battle we will need to put on the full armour of God. Ever since what happened at the cross, Satan is really a defeated foe (Colossians 2:13-15, Hebrews 2:14-15). And yet we live in the tension between what is and what is still yet to be. The ultimate war is won but the battle still rages and the devil still has power to attack us. He will do everything he can to destroy our hope, to knock us off course and distract us from serving Jesus. If we are to step out and serve Him on the front line with the people that God has brought into our lives then we should expect to face opposition. If hope is to prevail, if we are to stand firm then we must cultivate the armour that God has made available to us. The challenge for me (and perhaps also for you) is to stand firm with God’s strength and resources rather than trying to do so on my own. Paul is clear, the battle is fierce and going it alone will not see us stand firm! Join me today in setting your hope on Jesus, putting on the full armour of God and standing firm in His strength.